It was warm by early afternoon, seventh period, the final trip to the farm for the year. The admittedly acrid smell had receded fivefold into the last warmth of autumn, but the compost pile still needed work. “Well, at least you don’t have bugs in your shoes,” said Mason VanDercar, a Junior, from behind the retaining wall made from pallets and other tattered bits of reclaimed wood, pitchfork at the ready. Mason appeared to be coaching his friend Keiju Williams, also a Junior at Boise High School, a public school serving about 1,500 students in downtown Boise, Idaho. “Just another day in Environmental Science, right Mrs. Ward?” Keiju quipped. Earlier that morning students had cracked into the pile, needing to turn it and mulch it in a little early. Though the compost had not yet reached its prime, room simply must be made for winter. The wilted outer leaves of greens, carrot peels, coffee grounds, and other deli compost from the Boise Co-Op’s kitchen will keep coming, no matter how cold it gets or how deep the snowbanks are. In the early morning, students marveled at the heat of the compost, 125 degrees inside the pile, with frost on the ground all around. It was a moment of ecosystems, of cellular energy and decomposition, nearly magical to behold, almost ready to coax life and nourish the cover crops. Though the prospect of new floral life from food waste was of universal interest to the students, the smell was not universally enjoyed. The lot where the students stand has been many things to many people over the years. Only six blocks from the State Capitol building, and two blocks from Boise High School’s compact urban campus, this block once contained residential lots and homes. Many neighbors have stopped by to share their memories of barbeques and porch greetings. In the early part of this century the homes were moved or demolished, and the block was acquired piece by piece by the neighboring church, The Cathedral of the Rockies. After some of their development ideas stalled, the land sat stagnant. After being cleared and barren for nearly a decade, a small passionate neighborhood community garden was formed, The Downtown Community Garden. Boise High School’s Science Department formed a relationship with that organization to provide fieldwork opportunities for Biology classes. When the initial community garden effort seemed to stall, the school, already having a neighborly relationship with the church, stepped into a leadership role in the winter of 2011. With dreams of fresh veggies for the cafeteria and lifelong hands-on learning for students, Boise High School’s Science Department pledged to organize the community garden and coordinate the project as a school garden. Developing a teaching space on the entire lot (half of a city block, about one-acre) required working in phases. By forging partnerships, writing grants, and engaging with neighbors, neighborhood associations, the City of Boise, and passers-by, The Downtown Teaching Farm now finds itself heading into its ninth growing season. Developing this lot into a school garden was not easy. This fully exposed heat-island is not exactly a big backyard garden, nor is it a series of confined raised beds on school grounds. It is large and wild, and when we started out eight years ago, the soil had very little organic matter, most having been scraped off or volatilized while vacant. The aggressive weeds that love vacant land in the area, plants such as goatheads (puncturevine), cheatgrass, field bindweed, and rush skeletonweed, held dominant roles in the soil. But the potential to restore such a lot, in the center of the capital city, was too good to give up on. Lessons of note are plentiful – chief among them being how to design irrigation systems, which are absolutely necessary in this high-desert climate. After much research and minimally-successful attempts at drip systems, Boise High School sought the expertise of local farmer, Mike Sommer, of Purple Sage Farms. Mike was asked to “train the trainer” in drip irrigation and t-tape systems. Since then, laying drip tape and testing the fittings has become an environmental science lesson. Soil-building initiatives have also taken partnership and creative thinking. Boise High School first formed a partnership with local arborist Peter Henderson, who generously delivers ample wood chips and is a true carbon-sponsor. The Boise Co-op has also been an outstanding partner by donating their food scraps and cardboard (which is used extensively as a weed barrier under the wood chips). In one year, 15 tons of food-prep waste from their deli has been composted. This is tremendously valuable to them, as the city does not currently offer corporate municipal composting; in turn, they are an invaluable nitrogen sponsor for the farm. Ample room has been created to capture leaf waste from neighbors, the church, and the school – each year, leaves from an estimated eight square city blocks of deciduous trees are brought to the farm. This reduces custodial man-hours as the leaves don’t need to be bagged, as well as the amount of organic waste going to landfill. Fallen leaves, along with leftover straw bales, are an essential supply of weed-free mulch. Although they take effort for students and community gardeners to move around throughout the year, they are invaluable to cooling the soil, slowing evaporation, adding humus, and discouraging weeds. One of the most effective methods is to heavily mulch with cardboard covered with wood chips on the paths, and thick leaf or straw mulch on the bed surfaces. A glorious day of smashing pumpkins after Halloween is a favorite high-carbon input lesson. To eradicate and control weeds organically it became apparent that more classes needed to be out at the farm using it as a classroom and work-space, and more volunteers would be needed during the summer. One fall, Boise High School’s Biology classes pulled 14 dumpsters worth of tenacious bike-ride-wrecking goatheads as a first case study in invasive species. Construction of an outdoor classroom space three years ago provides necessary respite from the summer heat and more opportunities for summer harvest gatherings for volunteers and students. Through trial and error, we discovered that low-till methods work best for managing aggressive annual weeds at the farm – as well as the added benefits of self-sewing flowers and reseeding cover crops such as mustard greens, clovers, chicory, and turnips. The addition of summer internships has proven to be absolutely essential. Training begins in April and May and during the summer interns volunteer on their own time with the guidance of teachers and experienced community gardeners. 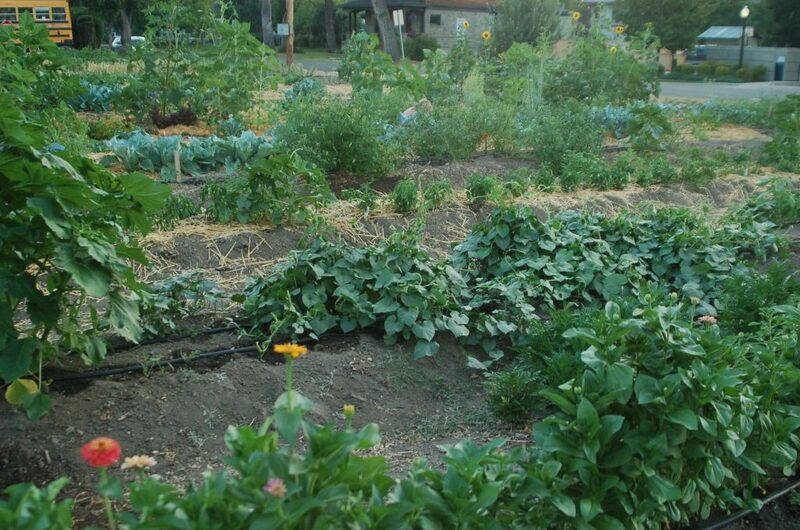 Over time, annual veggie and flower beds have been converted into long-term plantings – an orchard of approximately 40 trees, vast berry rows, grapes, herb garden beds and pollinator garden beds, and an apiary area. A full schedule of workshops will be added this year, bringing in local experts in various topics to serve students and neighborhood urban gardeners. 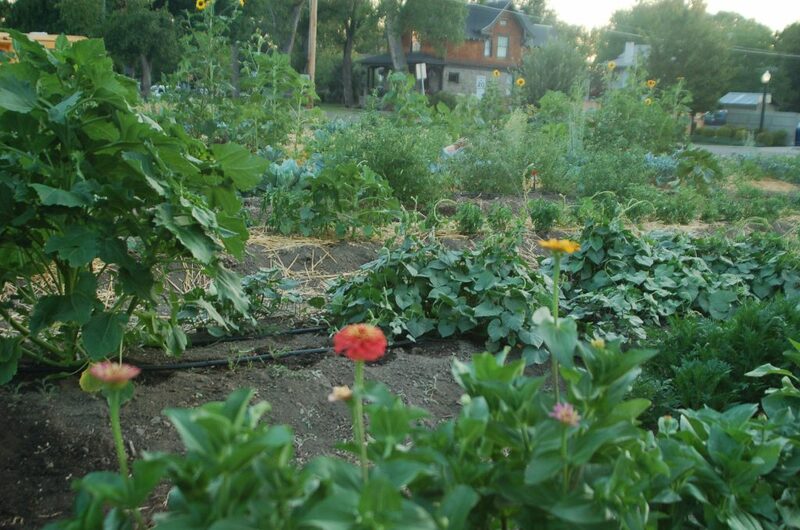 Situated just two blocks from Boise High School’s campus, the farm has completely porous edges, with zero fencing. This creates an unusual green space, both messy and park-like, that people pass through at all times of day and night. Communicating between these folks, the students and staff, and the community gardeners, remains a constant challenge. Weekly emails help all on the distribution list know the priorities and garden-together times. Signs and reminders direct those on the ground or passing through. Flower picking is always encouraged – signs say “please pick the flowers.” Fruit is shared amongst students and adult gardeners through a work-harvest honor system. It reads very simply, “For every hour of volunteer gardening, harvest enough for a meal for your family.” This system works well enough, but because everyone is harvesting everywhere, individual plots are foregone and large 100’ row plantings of various crops and flowers are tended communally. The planting and management plan, as well as grant writing, is coordinated through Boise High School’s Science Department. Most importantly, students have posed questions and sought answers throughout this project. Teachers in many departments have used the Downtown Teaching Farm as a site for thematic project-based learning or other types of Inquiry Units. Several Sophomore English classes examine the essential question: What is Good Food? which allows students to research and compose their work around their own points of inquiry into modern and sustainable food systems. In Environmental Science, a recent essential question for a unit on biodiversity was: How can we ensure food and safety for all, including the wild things? – addressing the tremendous pressure that modern agriculture is putting on land use and indigenous species globally. Other classes have delved into questions centering on Wellness or Happiness, as well as more traditional units on Soil Science or Water Quality. All classes are welcome to come and serve at the Downtown Teaching Farm and experience the connections between this plot of land and these large, and at times abstract, global issues. After eight years of work that began with seeds and hoses, the farm has sprouted into a schoolwide project-based learning movement. Student leaders from Boise High School’s AVID (Advancement Via Individual Determination) program coordinate with staff and community mentors to create an annual culminating event known as a Summit. The first Summit, held in 2014, was a Food Summit. It was followed by Wellness, then Sustainability in 2016 (including a Big Read of Edward Humes’ Garbology). The past two years have focused on Social Justice. In March of 2019, students and staff will come together to learn from each other based on the theme of Common Ground. With a whole year dedicated to conflict resolution and use of Rogerian arguments, students will participate in a full day conference-style event, complete with activities on campus and at the Downtown Teaching Farm, breakout sessions, a keynote speaker, and student-organized workshops. During this event, a Peace Garden will be planted with the help of different student groups. The Peace Garden will feature iconic plants and staple crops from around the world, honoring the homes and cultures of Boise High School’s refugee and international families. In the time our community has spent with the Downtown Teaching Farm, connections have been built, learning (and growing) has taken place, and neighborhood unity has been restored. These outcomes are priceless. 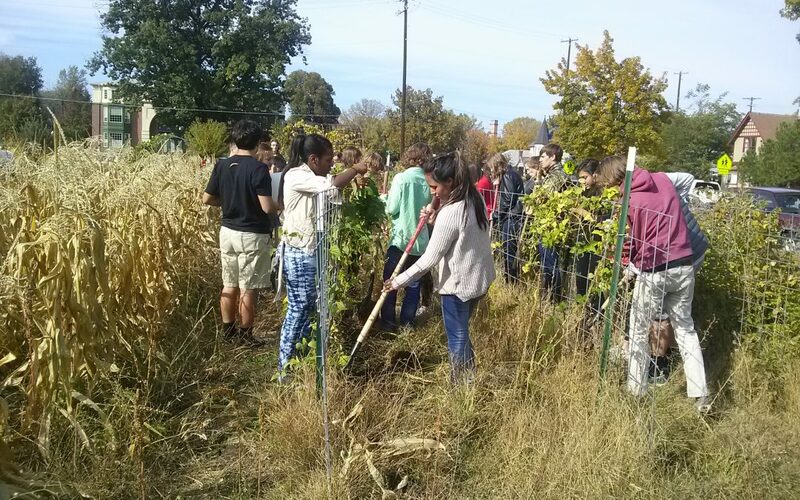 It is easy to fantasize about future generations of students and teachers connecting with their city through the farm. But in truth, the Downtown Teaching Farm, though a fast fixture at Boise High School, doesn’t yet possess the permanence many wish it did. The district doesn’t own the land and the church may at some point decide to develop it. Even still, educators continue to sow seeds on this plot of land because they know that communities and generations to come will reap the benefits of what is being learned every single day at the Downtown Teaching Farm. You and the farm are awesome. I’m proud to call you my friend and colleague.